Yes, yes, this is a screaming, how-do-these-guys-do-this deal, for sure, but what we want to tell you is that we had this beautiful bottle *(OK, truthfully, FOUR bottles)* over Thanksgiving. And then when we got back to the office we bought a case. OUTRAGEOUSLY GOOD, serious, grab-ya-by-the-palate bubbly. GRAND CRU! 100% Chardonnay! 5 years on the lees!! STUNNING price, truly! OK, ok, sorry. But….wow. For under $30, a colossal no-brainer for the holiday. It’s toasty/citrusy brilliance, and with the 5 years on the lees (the yeast sediment) there is a whole other dimension of sweet bread dough, toasty croissant, ginger and lemon extract...fresh, pure, and immensely satisfying. The bottling comes from the family’s Grand Cru vineyard holdings in the coveted Le Mesnil-sur Oger area of Champagne, and is basically a Blanc des Blancs, being 100% Chardonnay, which we happen to love, too! So this really hits ALL of our bubbly buttons, oh yes!! What a price!! For Grand Cru!? C’mon!! Not a lot to go around unfortunately --- gotta put some in the wine rack or cellar TODAY! Woo hoo! While it lasts..! 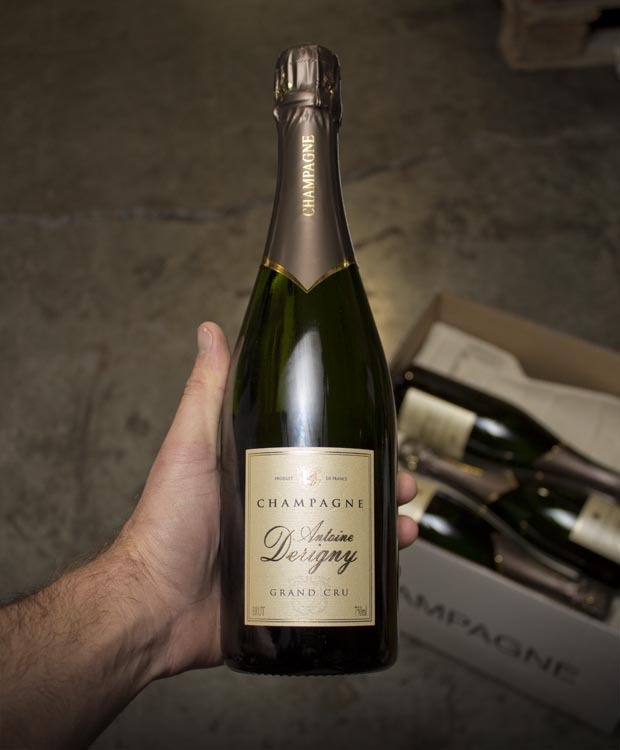 Antoine Derigny is a second label made by the House of Champagne Bernard Remy. While not as old or as big as some famous Champagne brands, it compares favourably with these large producers for the consistent quality and vivacious character of their family made Champagne. The estate located in the village of Allemant on the Cóte de Blancs, not far from the big and bustling cities of Reims and Epernay, was created 50 years ago by Bernard Remy. After working from 1996 under his father his son Rudy took over in 2008 and has since expanded the business. Initially very small, with just a few vines of his own, the family business expanded at a steady clip. It is now comprrised of 11 hectares in various locations which includes some highly reputed vineyards in the Grands Crus area of Mesnil-sur-Oger and in the Montagne de Reims area. At first concentrating on the market in France the estate has now expanded its business to serve customers in Europe and Asia. The son, like his father, primarily seeks to create Champagne which is sophisticated and refined with subtle, delicate flavours. Their expansion into different areas of the champagne was carefully planned so as to add and round out the quality of their Champagne. They grow Chardonnay in the Cóte de Blancs and the Cóte de Sézannais, Pinot Noir in the Aube area and Meunier in the Vallée de Marne.